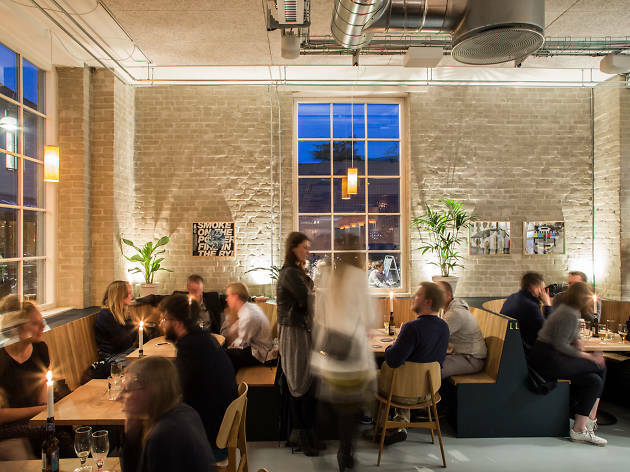 The restaurant and bar scene in Copenhagen has exploded in the last few years. 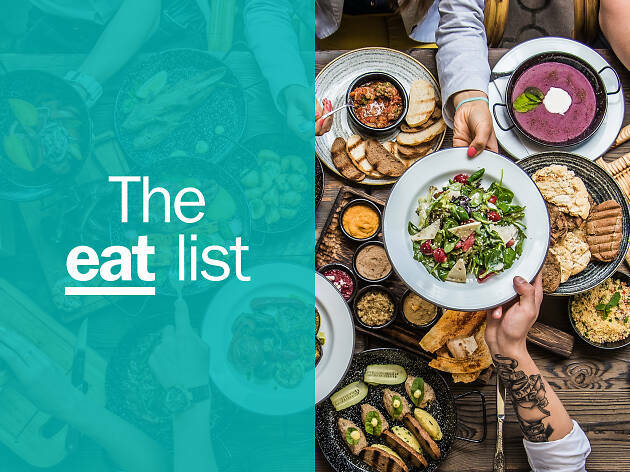 On any given visit you'll be sure to find a huge variety of quality bars, swanky restaurants and bistros, as well as innovative food markets, delis and bakeries. 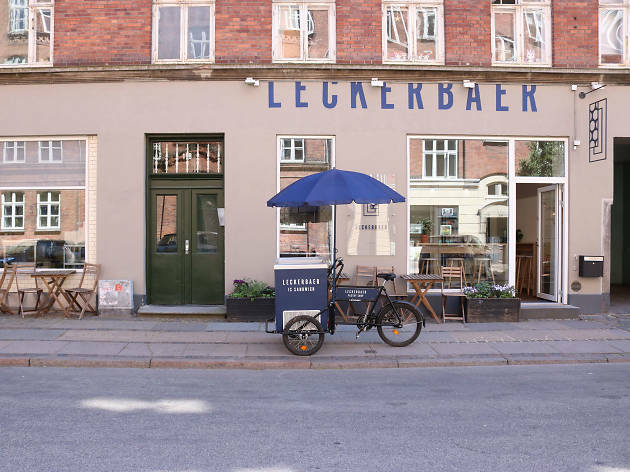 You'd do well to sample some of the Danish classics (one of the top things to do in Copenhagen), like frikadeller (meat balls) and pandekager (a thin pancake), as well as some modern innovations made with local, seasonal produce. But whatever your preference, you certainly won't go hungry in this city. 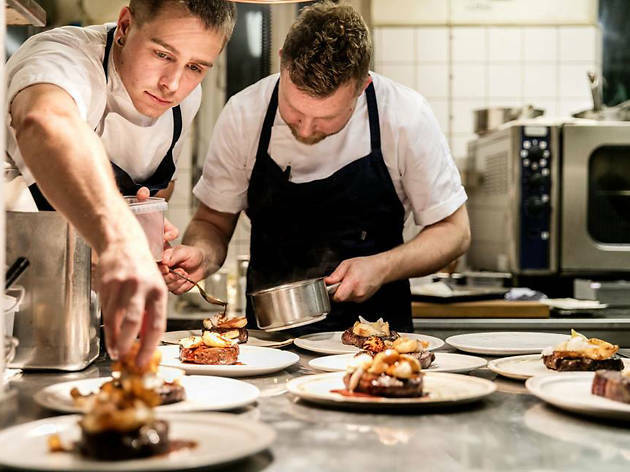 Check out our pick of the best restaurants in Copenhagen. Why go? 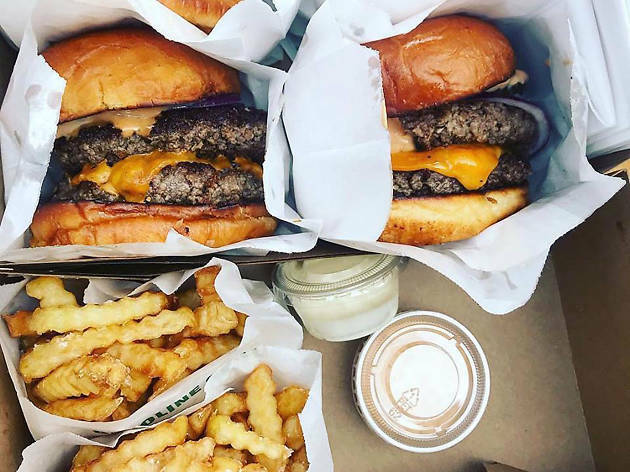 This top-notch burger joint is situated in an old petrol station. Good gimmick? Yes. Good food? Also yes. The Gasoline grill serves four different types of burgers and the queue outside is often long but don’t let that scare you away. They keep on delivering the meaty goods until they sell out. Try the Butterburger – literally a burger with a knob of butter on top – so simple but simply divine. Why go? This joint is all about simple, tasty, fresh seafood. You’ll be hooked in no time. From its humble beginnings as a food truck to its current proper seafood restaurant, Hooked has always spoiled diners with simple, tasty fish dishes – guaranteed to be a hit any day. 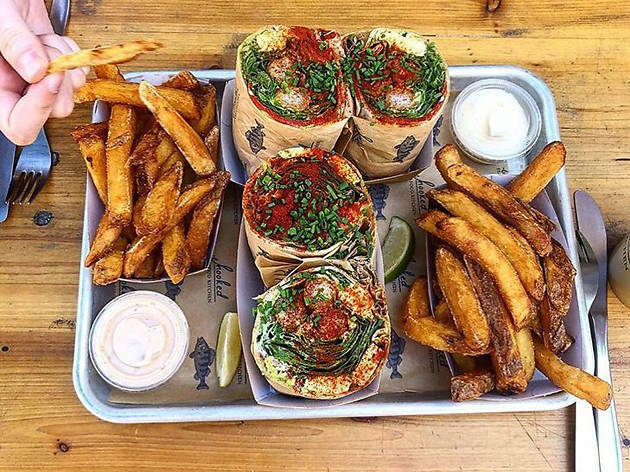 The main dishes vary from lobster rolls to fish burgers and traditional fish and chips, as well as a poke bowl. Hooked newbie? Go for the combo bowl – and the authentic vinegar fries -– they’ll remind you of bygone summers spent at the seaside. Why go? Bag the best water views in the city at this restaurant on the pier. La Banchina, which means ‘the quay’, is the coolest hangout in the city in the summer months. 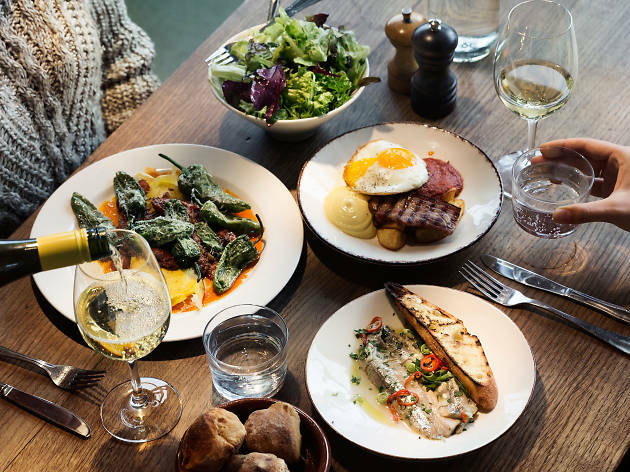 The restaurant serves simple Italian food and natural wine and is one of Copenhagen’s real hidden gems. Go for a swim and then soak up the last of the evening sunshine here with a drink and some pasta. What a perfect way to spend a summers eve! Why go? 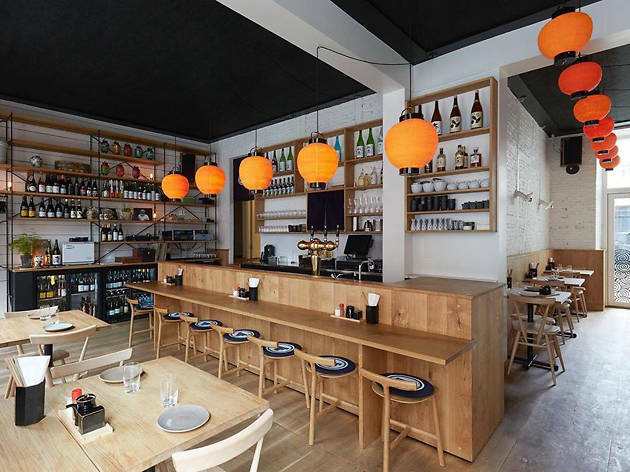 This is Copenhagen's go-to spot for sake and Japanese cuisine. Named after the izakayas of Japan – a sort of laidback drinking joint – Jah Izakaya combines food and rink to a tee. Sample one (or all if you're feeling gutsy) of 16 authentic sakes, and line your stomach with small plates that are like a Japanese tapas. These include things like sashimi, tataki, tempura and more. Why go? For affordable Nordic cuisine at the best looking Scandi-style restaurant in town. 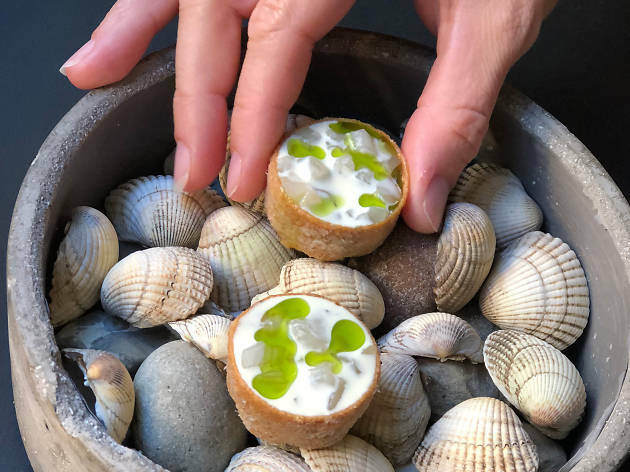 Höst means ‘harvest’, so it’s no surprise that this stylish Nordic eatery offers good quality dishes made using seasonal regional produce. Expect to feel like you’re dining in a very cool living room – think raw brick walls with Danish wooden furniture and sheepskins. This spot is perfect for Instagramming. Why go? Gemyse will teach you a thing or two about vegetarian eating. Forget about overcooked carrots and boiled potatoes, here you will be served delicate and beautiful plates with a focus on taste and texture. Plus, they’re often adorned with edible flowers and herbs from the garden outside. When you have indulged in vegetables galore, it is time to go outside and make your own snobrød. It’s bread on a stick cooked on the open fire. You can even toast marshmallows for dessert. Why go? La Neta means ‘the truth’ in Mexican, and that’s exactly the vibe of this no-nonsense taquría. La Neta is a small gem in Nørrebro, with authentic Mexican decor as well as some impressive tacos and quesadillas to boot. The place has a cool look. 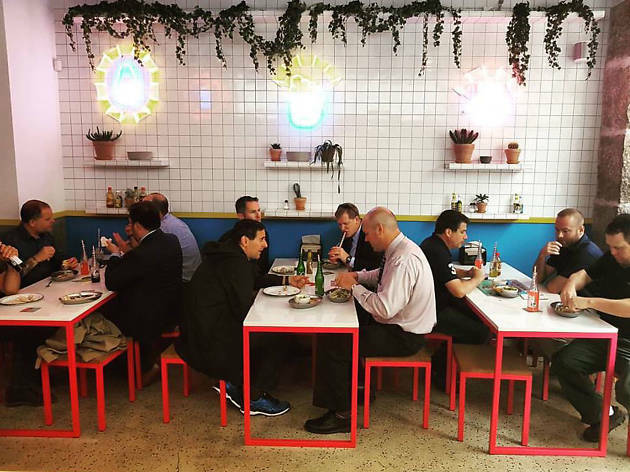 Think metro tiles on the walls, red tables and yellow bar stools. Le Neta is often packed but the atmosphere is great and as soon as you step in here you feel like you are in taquería in Mexico. Why go? 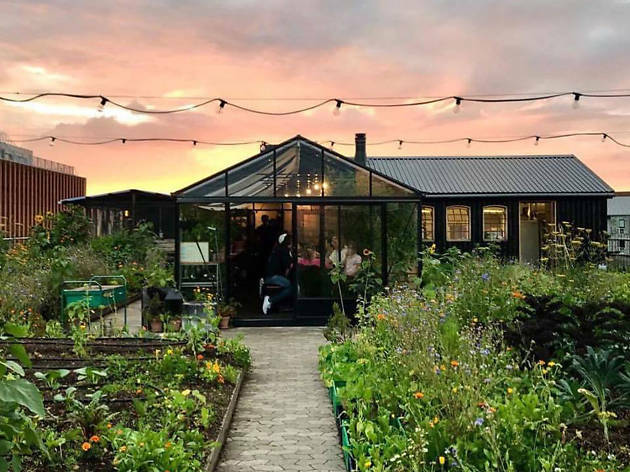 Imagine a rooftop urban garden and greenhouse restaurant that overlooks the whole of Copenhagen. Sounds perfect, right? 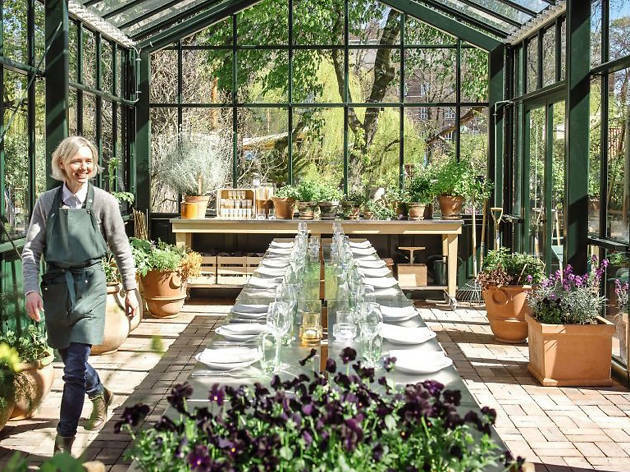 Gro Spiseri consists of a small team of excellent chefs who create tasty share dishes for you to enjoy ‘family style’ at a long wooden table in the magical greenhouse in the middle of the rooftop farm ØsterGro. 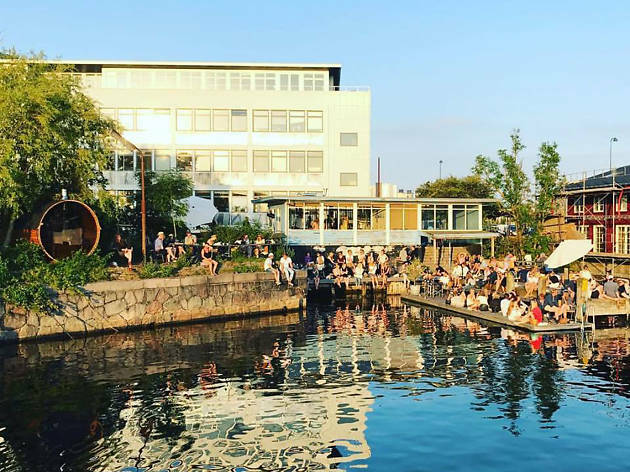 The restaurant and farm are situated on the roof of an old car auction house in Østerbro and you will enjoy some of the most impressive views of the city whilst eating, drinking and chatting to your fellow diners. Book in advance and go at dusk. Why go? For Danish open sandwiches – smørrebrød. The world-famous Danish dish and a must-try when visiting Copenhagen. 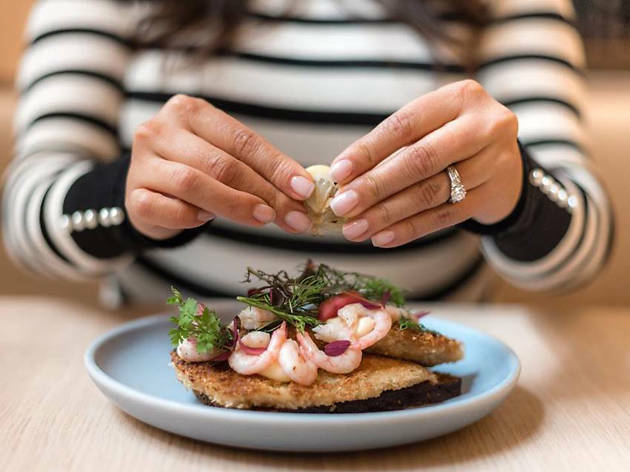 Adam Aamann – also known as the king of smørrebrød – has recreated the traditional Danish smørrebrød with interesting combinations of ingredients, lots of flavours and dedicated gastronomic craftsmanship. At Aamanns you will be served traditional Danish meals from everyday life, just updated and perfected. The summer classic kartoffelmad is might be simple – it’s just potatoes on rye – but you will never forget it. That’s a promise. Why go? This bakery is sugar-coated heaven. Since when does a pastry shop get to feature on the list of the best restaurants in Copenhagen? Since Leckerbaer decided to make intricate, beautiful, quaint and delightful cakes that taste like a little bit of heaven and looks like pieces of art. Stay for a coffee and tuck into the best looking and tasting lemon meringue pie in town. You can even watch treats being made through the window into the kitchen. Why go? ‘Brus’ means bubbly in Danish, and this is the perfect description of the atmosphere in this microbrewery and restaurant. Thirsty? Top of the range beer is brewed on the premises at this microbrewery situated in an old iron foundry and locomotive factory. Once you’ve drunk up an appetite, get yourself some of the easygoing bar food on offer, all perfect for sharing. Or come in the morning – Brus does one of the tastiest brunches in town. If you are not fond of beer, they also brew keg-ready mikropolis cocktails. Our favourite is the Organic Rhubarb Crush. Why go? For cutting-edge organic Nordic cuisine. Situated in an old apartment in a picturesque cobblestone street, Marv & Ben is all about Nordic food prepared with a curious mind. Expect to try adventurous new flavours and textures – all made with local produce sourced from small independent producers. Why go? Paté Paté is one of the oldest restaurants in the Meatpacking district, on the sunny side we might add. PatéPaté is located in an old paté factory and is one of the most loved hangouts in the Meatpacking district. The food is a mix of Mediterranean, Moroccan, French and Spanish cuisine. 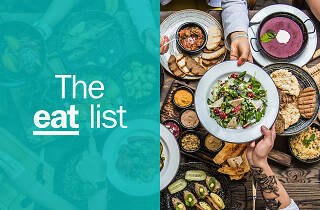 Opt for a few things from the small dishes menu in order to try as much as possible. They also have a vast wine list to work your way through. It’s a buzzing place to a hang out for a whole evening. Planning a trip to Copenhagen? This picturesque modern city has everything your heart desires. 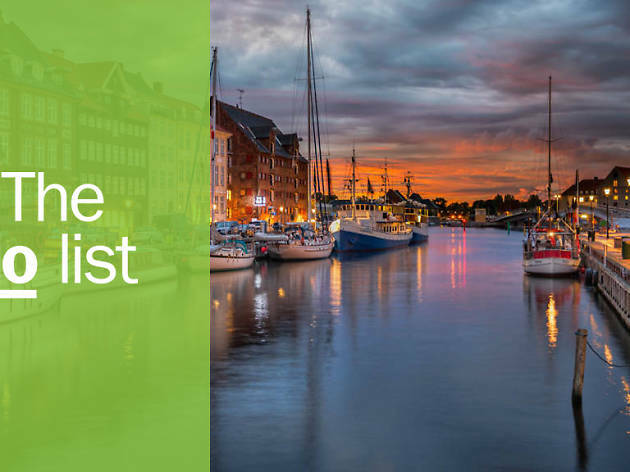 It’s a go-to spot for innovative Nordic cuisine, fast-moving streetfood, architectural gems, Danish design, picture perfect Instagram spots and the easy life by the waterfront. Map out a top-notch itinerary with our go-to guide.